Posted on July 3, 2010	by Lou Murray, Ph.D. Step 1. 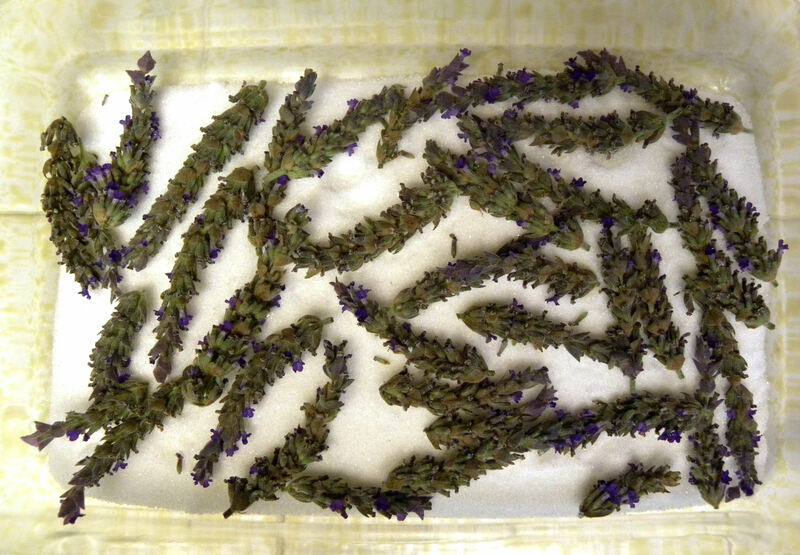 Layer 1/2 C lavender flower heads on a glass dish holding 1 C. white sugar. Step 2. Add another 1.5 C sugar to dish, cover with a cloth kitchen towel, and let sit for two weeks with occasional stirring to let moisture evaporate. Step 3. Sift sugar to remove flower heads and store sugar in a tightly sealed glass jar. After addition of sugar to flower heads. I really have come to love lavender sugar. It has such a lovely floral/musky scent and flavor. I use it on fresh fruit and cereal mostly, but I plan to make some lavender sugar cookies with this batch, and maybe a lavender cake with the next batch. Harvest a big handful of English or French lavender flower heads (about 1/2 C) by snipping the flower stem at the base of the head. I washed them the first time I made the sugar, but decided that it was an unnecessary step and just added more moisture that had to evaporate away. Put 1 C white sugar in a 2 qt Pryex baking pan. Lay the flower heads onto the sugar. Cover flowers with 1.5 C white sugar. Cover dish with a clean dish towel and let the moisture evaporate for two weeks, stirring occasionally. Pour sugar through a strainer to remove flower heads. A few flowers will sift through, but that’s fine. 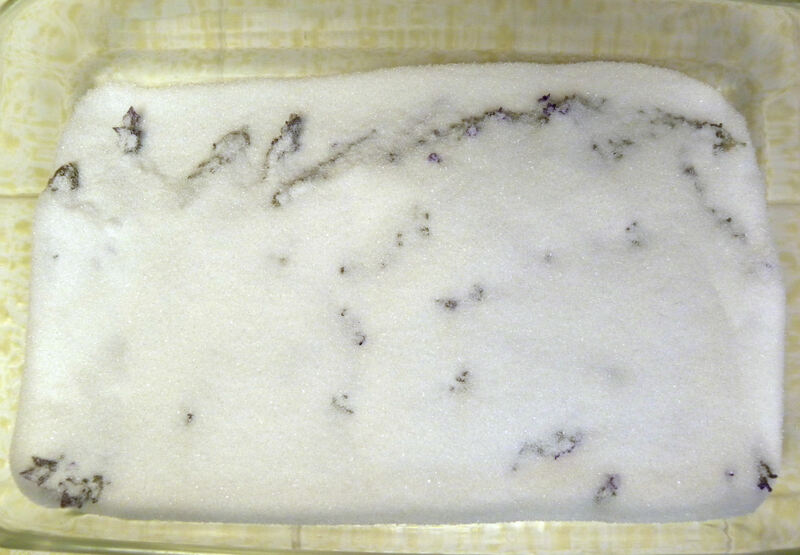 Store sugar in a sealed glass container. You can adjust the amount of flowers up or down, depending on your tastes. I love the smell of lavender, so I like the taste of lavender sugar. I was expecting a subtle flavor when I first made it, but the flavor is really quite pronounced. And delicious! Use it in your favorite sugar cookie or white cake recipe. Sounds wonderful! This is the first year I’ve had a lavender harvest so I might have to try that. I’m looking for other ideas to use my lavender besides sachets and soap. Thanks. Oh, lavender sugar cookies sound wonderful! I’ve never made lavender sugar, but it looks so easy. I’m going to have to try it! I love lavender…is there anything it can’t do? Thanks for this tip! I will definitely be making some, and soon as my lavender is in full bloom. Ali, Clare, and Lynda, good luck making lavender sugar. And Clare, I can’t figure out how to make lavender pay my taxes for me or clean up my office.